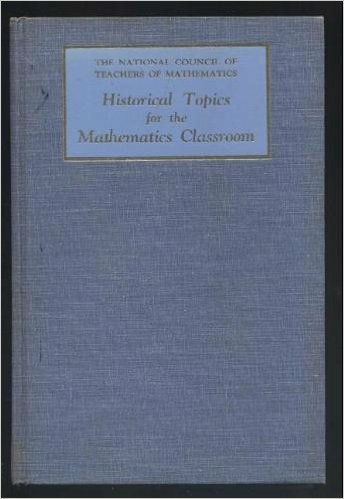 December’s Book of the Month is Historical Topics for the Mathematics Classroom by J.K. Baumgart, D.E. Deal, B.R. Vogeli, A.E. Hallerberg, eds., published by the National Council of Teachers of Mathematics. 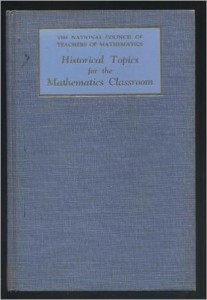 This book has a summary of the history of each major branch of mathematics (Number, Computation, Algebra, Geometry, Trigonometry and Calculus) followed by brief essays on specific topics of significance within each branch. The last two chapters of the book give a brief, integrated view of the direction of mathematics development over the last century. Originally published in 1969, and updated in 1989, the book continues to offer high school and university teachers an excellent tool for their own development. (Adapted from a review by Tim Keenan).